Once upon a time, I thought I wanted to be a “computer programmer” like my Mom. My job was to support the management team at the Consulting Company she worked at. I learned a lot about the consulting industry, knew how much money they made, and thought it might be something I’d like. There were a few people in the “computer world” that treated me like I was a stupid girl. A few were even vindictive enough to try to set me up to look like I was… Then, in college, I took a few computer classes, no big deal! They were pretty easy, and I was having fun learning new things. I took a database class in college, and HATED it! I decided that was probably not the right career path for me! It kind of makes me laugh that even though my career has nothing to do with the computer world, I am surrounded by it, with my Mom, brother, and boyfriend! I had always loved science and tutoring people. I decided I was going to be a Science Teacher, like my Grandpa… I took Calculus in college and got a D. I think it was a pity grade because he knew how hard I was trying! If I could barely pass Calc 1, and had to get through Calc 4 for a Biology major, that was going to be tough… I also was working as a manager at Pizza Hut at the time. I was easily frustrated working with teenagers and their attitudes. I remembered how much I had always loved little children, and seemed to draw them to me wherever I went… I thought maybe I should teach little kids! I graduated with my AA from Century College. Then, I went to Bethel College, where I graduated with a Bachelors in Family and Early Childhood Development. I got a job working at a child care center called All God’s Children Learning Center in Golden Valley, MN. I worked as an Assistant Preschool Teacher, and then as an Infant Teacher. I loved it there, and knew I was in the right field! I loved the bonds I made with the families, the Christian Environment, and all the friends I made! I ESPECIALLY loved working with all the little kids!! Several years later, I had moved over an hour away, and needed something closer to home. I found a job working in the School Readiness program in the Anoka-Hennepin School District. I loved this job too, for different reasons… The best part was still the kids, but working for the school district has other benefits. I got amazing training, great support from my Supervisors, and learned so much more about teaching, classroom management, etc! I worked with an amazing Speech Pathologist and 2 other awesome teachers that really helped me develop my love of teaching! Two years later, my husband’s job took our family to Chippewa Falls, WI. Unfortunately, my License didn’t transfer to WI, so I ended up in another child care center. I found Monkey Business, and felt right at home! I taught 4-5 year olds, an age group I feel I teach well. Then, I decided to try doing an in-home daycare so I could have more time with my kids. I did that for a year, and then went back to Monkey Business. 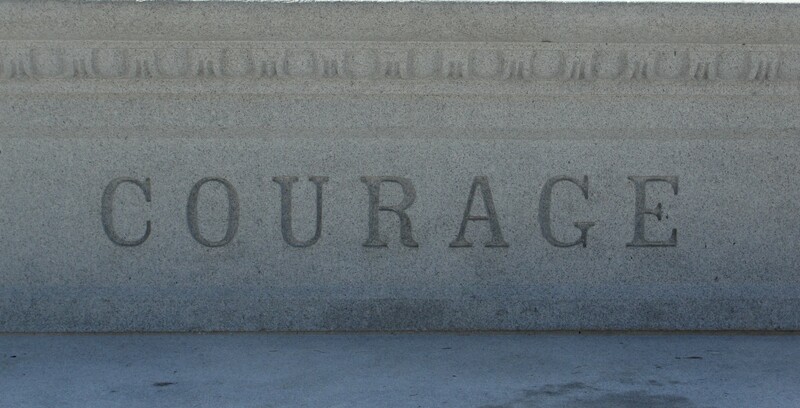 So, what does this have to do with me being in Nashville with a bunch of computer geeks, or “courage” for that matter?? Not a whole lot in some ways, and a ton in others! Last night, Jason and I were at the Speaker Dinner. It was a very casual BBQ at someone’s house (and no, sloppy joes were not served). I didn’t know anyone except Jason, so I just listened to all these people sitting around, talking about SQL Server, their blogs, their careers, etc… A couple guys were sitting around talking about books they wrote. One of them, Thomas Larock (twitter|blog), was talking about his career, and this book he wrote, DBA Survivor: Become a Rockstar DBA, about Professional Development and taking charge of your own career. He said he basically took all the mistakes or things he didn’t like about his previous job, and wrote about how to make things better. This conversation that I was not even part of really got me thinking. Do I really have control over my career?? Am I doing everything I can to make sure I am getting exactly what I want out of it? What about my life in general? Do I really have the courage to take control of my life? Courage is a big word… I have had the courage (finally) to make some needed changes in my life. I got divorced almost a year ago. It was probably the hardest thing I have ever done, because I was forced to take back over my own life. This was NOT easy for me! Since then, I have been working very hard at getting my MN Teaching License renewed. I let it lapse in the past 2 years since it didn’t transfer to WI anyway. I am doing what I can do to make my job exactly what I want it to be! I am working with 2-3 year olds this summer, and loving it! I am doing the best I can with my own 2 children… I have goals for where I’d like my life to be in a year, and I am working towards those goals. After 33 years, I’d say it’s about time I take the courage to be the person I have always wanted to be!!! It sounds like we have been thinking along the same lines in terms of career goals and life in general. It takes courage to make those changes to make yourself happy 🙂 Shoot for the stars, Sarah! You are doing an awesome job conquering your fears! Way to show others how courage is done! Trackback: Continuing Education « Moments of Brilliance… or Not! Trackback: Personal Branding – make people know who you are « Moments of Brilliance… or Not!